Klaus Schwab, founder and executive chairman of the World Economic Forum, addresses a news conference ahead of the Davos annual meeting in Cologny near Geneva, Switzerland, Jan. 15, 2019. 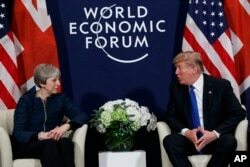 FILE - U.S. President Donald Trump meets with British Prime Minister Theresa May at the World Economic Forum in Davos, Switzerland, Jan. 25, 2018. Neither will attend this year. 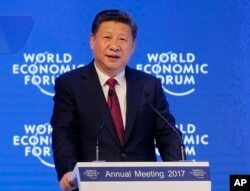 FILE - China's President Xi Jinping speaks at the World Economic Forum in Davos, Switzerland, Jan. 17, 2017. 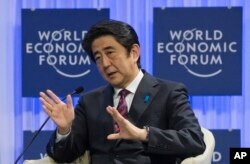 FILE - Japanese Prime Minister Shinzo Abe speaks at the World Economic Forum in Davos, Switzerland, Jan. 22, 2014. 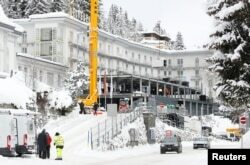 Construction workers build a temporary pavilion in front of Hotel Belvedere in Davos, Switzerland, Jan. 12, 2019.